This club chair offers simple design and comfort for your living room. The plush stitched pillow back of the chair along with the reversible welted cushion create a comfortable seating option. The track arms and exposed tapered legs bring out the casual style. 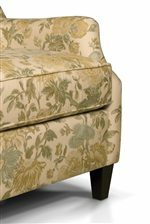 Match this club chair the matching ottoman for a comfortable place to relax. The Caboose Plush Back Club Chair by England at Crowley Furniture & Mattress in the Kansas City Area: Liberty and Lee's Summit, MO & Overland Park, KS area. Product availability may vary. Contact us for the most current availability on this product. Frame Construction Frame is made from 3/4" or 7/8" furniture grade plywood. Precision cut, fully interlocked frame with guide notches for accurate assembly. Perpendicular joints notched for increased overall frame strength. Frames reinforced with hardwood on stress points. The Loren collection brings a casual and comfortable style to your living room. This collection features a club chair and ottoman with welt cords, exposed tapered wood legs, plush cushions and track arms on the chair. The Caboose collection is a great option if you are looking for Casual furniture in the Kansas City Area: Liberty and Lee's Summit, MO & Overland Park, KS area. Browse other items in the Caboose collection from Crowley Furniture & Mattress in the Kansas City Area: Liberty and Lee's Summit, MO & Overland Park, KS area.